The Irish whiskey sector is thriving; the renaissance, the revival, the comeback, the innovations - we've heard so much in the last few years. Quite rightly so. We have seen an upsurge in interest and sales, in Irish whiskey tourism and in export growth. Amidst all the furore something quite remarkable and unforeseen occurred this weekend past, showing signs of innovation and ingenuity, but from the most unexpected of places. 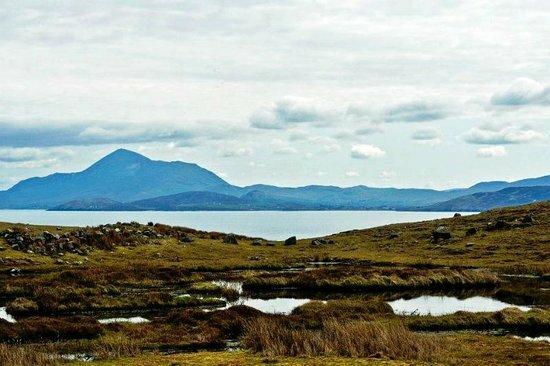 Clare Island, a tiny Island at the entrance to Clew Bay off the coast of County Mayo on the West of Ireland has undertaken a venture quite unique, certainly in Irish whiskey terms. Something that although minute in scale compared to even the smallest bottlers, shows that entrepreneurship and innovation is alive and well in rural Ireland. With its beautiful scenic and mountainous terrain, Clare Island has a population of just 145. National Geographic nominated a visit to Clare Island as one of the top 10 activities along the Atlantic Way. At only 5 miles long by 3 miles across, the Island has 2 hills, a sandy beach, a hostel, a cafe, a bar and restaurant, a community centre bar, a food store and a lighthouse. The local ferry service, Clare Island Ferry Company, has been owned and run by the O'Grady family since 1880, taking passengers on the 10 minute crossing from Roonagh Quay to the Island. Carl O'Grady involved in the family ferry business had perchance an unusual conversation with his cousin Paul Moran. Both share a passion of whiskey and the sea, and the thought to combine both intrigued them. The idea to mature the whiskey at sea was born. The idea of using the islands wild Atlantic exposure and the pre-existing family ferry business for this product was too exciting of a prospect to ignore. Although it's not new for spirit to mature at sea, it is a first for "Irish Whiskey". Why the quotes? We will come back to that. In the United Stated this has been done before off the coast of Costa Rica to produce Jefferson's Ocean Aged at Sea straight bourbon whiskey. It would have also been done before as bootleggers would have laden their barges with casks full of clear liquid. After several months at sea and the constant rocking of the casks would mean accelerated maturation as the alcohol came into more frequent contact with the wood, adding colour and flavour. Similarly with fortified wine from Madeira, the wine’s flavor deepened and the term “Vinho da Roda” became used for this sea-aging. So similarly with Clare Island Whiskey. Their boat, the Dolphin, is to act as cask bearer for Clare Island Whiskey. Clare Island does not have a distillery of its own and is unlikely to have one for the foreseeable future due to the significant costs associated with setting one up. The next best thing however is the closest distillery to Clare Island, the County Mayo based Connacht Distillery, which produces a spirit which embodies all of what is the Wild Atlantic in its raw spirit. On the deck of the Dolphin with cask secured. Back to the conundrum with all of this? Is it, or can it ever be "Irish Whiskey". With the Irish Whiskey Association having attained Geographical Indication (GI) protection for Irish whiskey, with the definition of it being distilled and "matured on the Island of Ireland". Have Clare Whiskey set the cat amongst the pigeons? We'll see how this pans out. Either way, the final product will be known as “Clare Island Whiskey”- Matured at Sea. So what can we expect? Who knows? A spectacular complex and rewarding whiskey or a damp squid? In essence, it's the story here that matters, the sense of adventure, the willingness to take risks, and dare we say, to push the boat out! Irish Whiskey Magazine is the world's only magazine dedicated to Irish whiskey. Our publication helps share the story that is the Irish whiskey phenomenon. heritage and social integration of Irish whiskey, as well as all the very latest industry developments. To subscribe or to hear more about how we can help you reach your target market through our range of marketing opportunities, email info@irishwhiskeymagazine.com.